It is 5 a.m. on a Tuesday, and the sun is barely above the horizon. 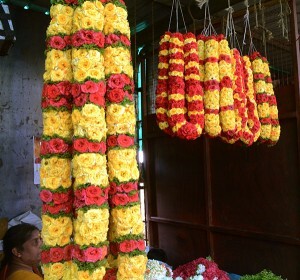 When most people are sound asleep or just getting up to start their day, flower vendors at City Market in southwest Bangalore, the city’s oldest and biggest market with approximately 800 shops, have been up for hours, buying from wholesalers and arranging their flowers for sale. 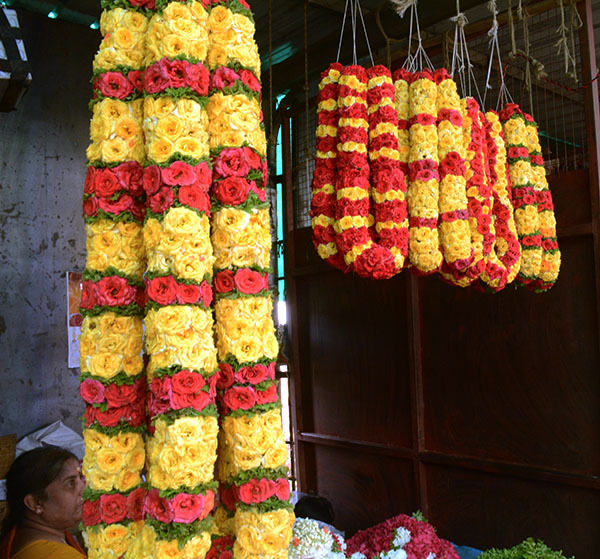 In Bangalore, stalls selling loose flowers and garlands appear throughout the city. Indians use flowers daily and for many reasons from weddings and funerals to hair decorations. Women wearing sarees with scented white jasmine blooms atop their long braids are a common sight. Worshippers place flowers in the city’s many temples every morning, and those who have pictures of Hindu gods in their home put flowers in front of them as well. One customer, Yasmeem, was at City Market to buy flowers for a special occasion, the anniversary of the death of her parents. Rajeshwari, one of the flower vendors outside of City Market, said she has been selling there every morning, starting at 4 a.m., for eight years. She buys her flowers in bundles of 20 for 20 rupees, or about 31 cents, and sells them for 25 rupees, or 39 cents. During wedding season and festivals, the price of flowers quadruples, she said. 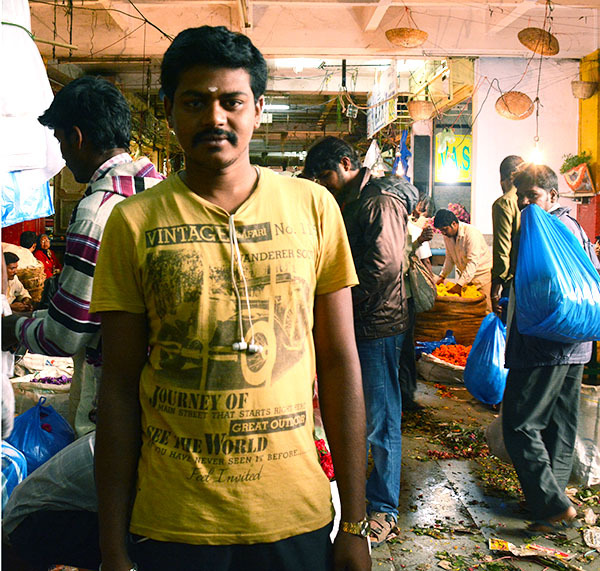 Vendors like Rajeshwari who work outside the market building have a limited time to conduct their business. “We’re not supposed to be in the area outside of the market past 10 a.m., and if we are, the police come to make us leave.” Rajeshwari said. 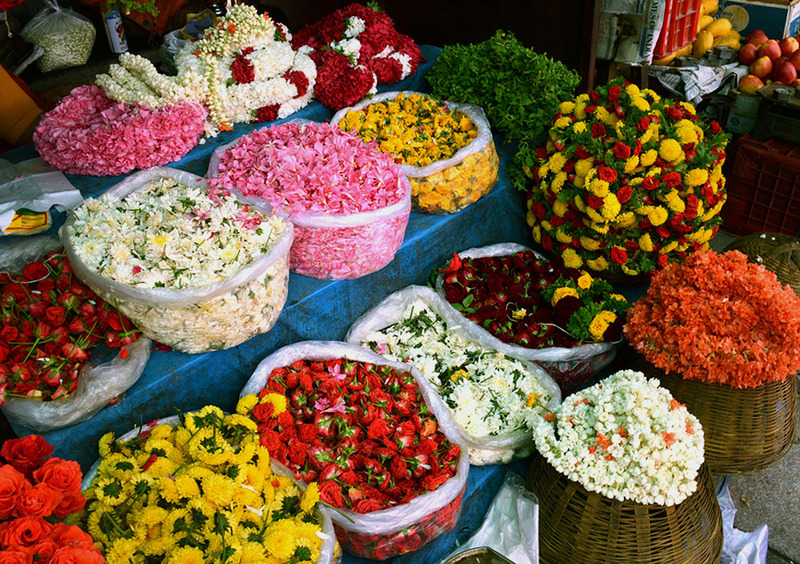 The flower industry in India is already huge and continuing to grow. According to The Associated Chamber of Commerce and Industry of India, the industry is expected to exceed $80 billion by the end of 2015. In 2014, India exported over 50 million pounds of floriculture products. India’s flower industry accounts for 75 percent of the global floriculture industry, according to the industry group. The growers bring fresh flowers every morning from elsewhere in Karnataka state and from the neighboring states of Tamil Nadu and Andhra Pradesh, Mohan said. The City Market complex is owned by the Bruhat Bangalore Mahanagara Palike, or BBMP, the city’s administrative body, which is responsible for its civic and infrastructural assets. A previous market in the same spot was demolished 18 years ago, and the BBMP built the current one in its place. To compensate displaced sellers, the BBMP allotted them space in the new building, although the spaces are often leased to other vendors. City Market has two sections for flower vendors, one for sellers of loose flowers and another for sellers of garlands, which are made on site. Stringing the garlands can take 20 minutes to three hours depending on the stringer and what kinds of flowers are involved. Some of the most elaborate arrangements are to be placed on the heads of brides. Brides may wear up to one kilogram of decorations in their hair, equal to 2.2 pounds. Senthil, a flower vendor who has a stand inside the market, has been selling flowers since he took over for his father 10 years go. He makes 500 rupees a day, which is about $8, he said. Besides the wholesalers and middlemen at City Market, Bangalore is full of retail flower vendors. In Malleswaram, a northwestern district of Bangalore, vendors work from a row of booths on the sidewalk. All of them said they get their flowers from City Market at early hours of the morning, every morning. 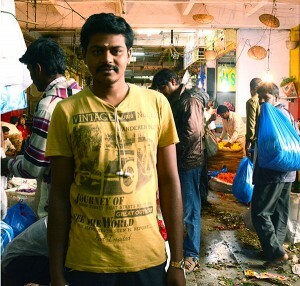 Vedhavashi, a vendor, said his biggest challenge is the lack of business. “There are many vendors along this street, and we’re all competing with each other while sitting right next to each other,” he said through a translator. Another vendor, Kumar, who said he has been selling flowers for 25 years, said that when people come to him for wedding flowers, he gets a truckload of flowers at 3 a.m. and starts putting everything together. Although the flowers are beautiful, some ugly issues arise with street vendors who don’t have stalls and who hawk their wares directly to drivers and pedestrians. According to the National Association of Street Vendors of India, city planners continue to neglect the vendors, some of whom are victimized, harassed, marginalized and pushed from one area to another. The association says that street vendors face mental and physical pressure from city officials, which has led to riots in some areas. In 2012, the government established a national policy called The Street Vendors (Protection of Livelihood and Regulation of Street Vending) bill. This bill covers registration of vendors, the rights of obligations of street vendors and the duties of local authorities. This entry was posted in Culture and tagged Alicia Bermudez, Bangalore, City Market, Flowers, JWWIndia. Bookmark the permalink.